Cardigans come in many colours although not all colours are acceptable in the show ring. Whatever the colour it is only cosmetic and does not affect the dog's health in any way. The breed standard states that the coat length should be short to medium, however occasionally we get dogs who are classed as "Fluffs" or "Fluffy". 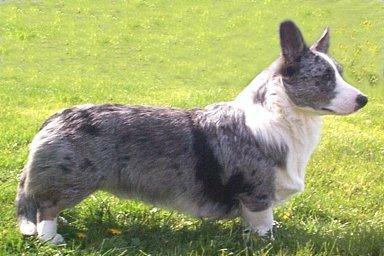 These dogs are very attractive as they have more coat, and often are more attractive than the classic coat. Again this coat length is only cosmetic and does not affect the dog in any way. As photographs of each variation becomes available they will be uploaded to illustrate the variations.